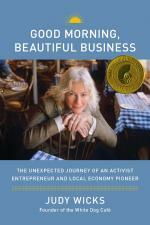 Judy is an international leader and speaker in the local-living-economies movement, Judy Wicks is former owner of the White Dog Café, acclaimed for its socially and environmentally responsible business practices. She is also cofounder of the nationwide Business Alliance for Local Living Economies (BALLE), as well as founder of the Sustainable Business Network of Greater Philadelphia and Fair Food — both incubated at the White Dog Café Foundation and supported by the restaurant’s profits. In her retail career, Judy was founder and owner of Black Cat, which featured locally made and fair-trade gifts for twenty years. In 1970, Judy cofounded the original Free People’s Store, now well known as Urban Outfitters. Her work has earned numerous awards, including the James Beard Foundation Humanitarian of the Year Award, the International Association of Culinary Professionals Humanitarian Award and the Women Chefs and Restaurateurs Lifetime Achievement Award. She lives in Philadelphia. Continuing her work to build a new economy of beautiful businesses, Judy mentors the next generation of entrepreneurs in Philadelphia.